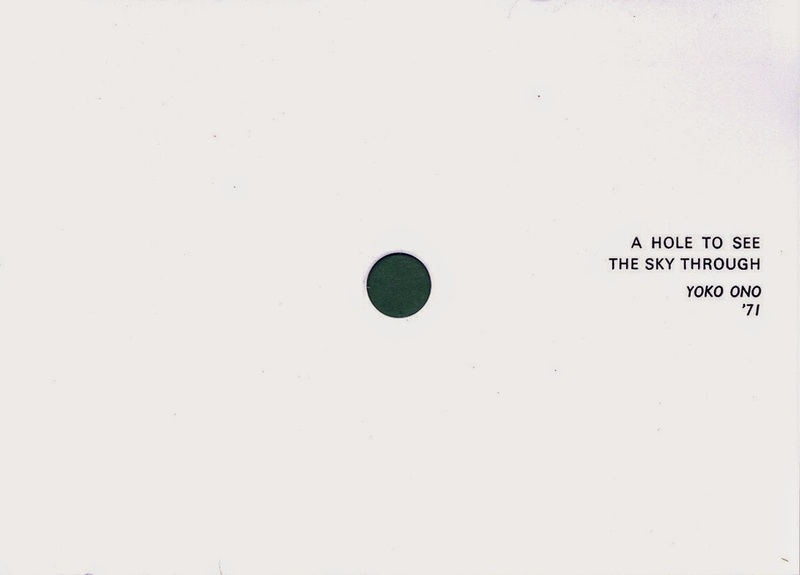 Ono has produced several cards with holes to see the sky/universe/rainbows through: the numbered card that accompanies the Rykodisc CD reissue of It's Alright (I See Rainbows) in 1997, a card included in the 2004 Yoko Ono Yes Box, the dust jacket flap of the monograph Yoko Ono Arias and Objects, etc. etc. This is the original 1971 version, published by artist Klaus Staeck. Edition Staeck has published numerous postcards by artists, including Joseph Beuys, Hanne Darboven, Robert Filliou, Sigmar Polke, Ben Vautier, and Dieter Roth, who responded to Ono's card (see following post).